1. Where were you born? What is your earliest musical memory? I was born in Exeter, UK (England) in 1944 where my father was the 5th generation of doctor in the same medical practice [since the late 18th century!] My mother had obtained a scholarship to Brussels Conservatoire on piano, but HATED it and would not have a piano in the house! She became a ballet dancer and also loved Ballroom dancing; I first heard music on the radio, usually dance bands. 2. What were your favorite things to do when you were in Elementary/Primary school? In my first school I loved visiting very old buildings [Exeter is a very old city] and I loved animals. 3. When did you decide to play a music instrument and why? 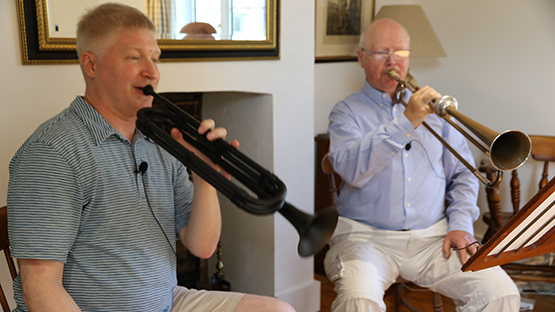 I had 2 elder brothers, one of whom was a very good trumpeter. When he came home from boarding school every holidays he complained that his younger brother [me] was always taking his trumpet to practice/play on, so my parents bought me one when I was 10 years old. 4. What kinds of music did you enjoy listening to as a child? Any specific musicians or concerts that you remember? I liked Dance [Big] Band music and still do, certainly I like music to have a tune. I had wax/vinyl records on a wind-up gramophone with steel needles, which wore out quite quickly. Such machines are in museums now! 5. Why did you decide to become a musician? At my later schools I played trumpet all the time - I never wanted to do anything else and haven't since! 6. 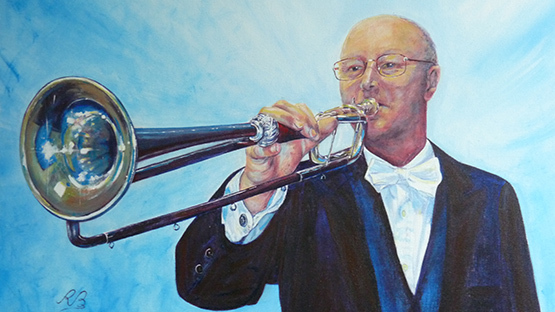 What are your favorite things about being a musician and playing brass instruments? I have been lucky enough to meet and work with all sorts of people from all sorts of countries and cultures; making friends is the most important thing in the world! Some have been very famous, some have had difficult lives, some are happy to be just ordinary. I value their friendships equally and take each individual and each day as it comes. 7. What are your other interests? 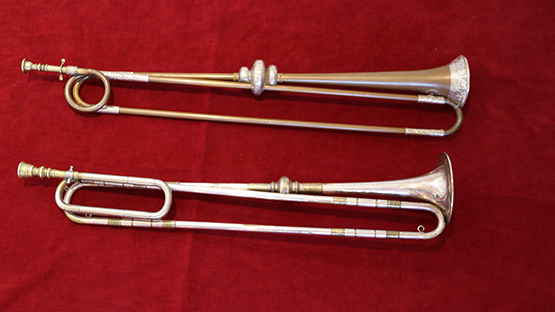 I collect and restore old trumpets and cornets, sometimes very old [I have 3 trumpets pre-1800]. 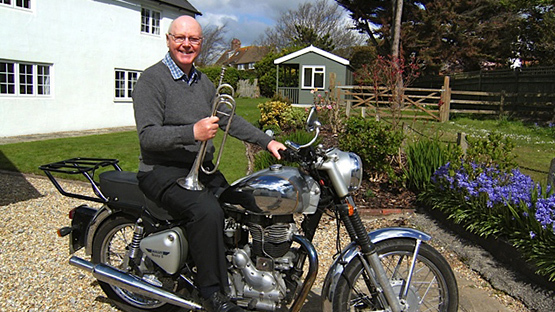 Also, I ride and repair motorcycles, another hobby where I meet interesting people; I joined my first motorcycle club at the same time as I started playing the trumpet. 8. What do you hope students will get out of learning with Brass for Beginners? 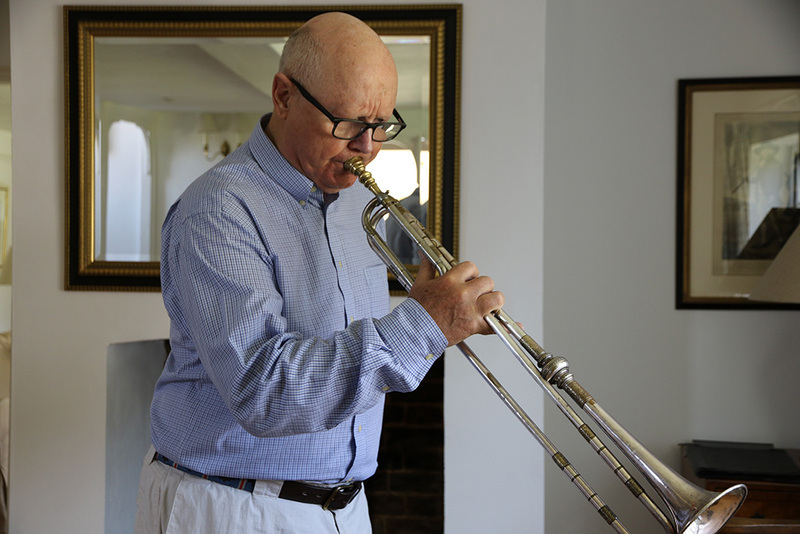 I hope those students who apply themselves to Brass for Beginners will benefit from starting a wonderful new hobby or interest, which can last them all their life - some might also earn their living by it. Others will understand and appreciate listening and hearing very good players perform. Above all it should always be fun even if, to get better, one has to practice things that do not seem easy at first. If you strive to make a beautiful sound, you will also give great pleasure to others. Copyright © 2017 Brass For Beginners, LLC.